“It’s in the rules, it’s not acceptable,” says Jim Gavin. Dublin senior football manager Jim Gavin. JIM GAVIN IS urging referees to be consistent in their implementation of the rules by ensuring that players are punished accordingly for sledging. The issue has been a talking point since Donegal’s recent Ulster Championship win over Tyrone, although Gavin says none of his Dublin players have complained of being subjected to verbal abuse from opponents. As per GAA rules, sledging is punishable by the issuing of a black card by referees. Doing so will alleviate the problem, the Dublin manager insists. “Referees need to be impartial and consistent, that’s one of the things they need to be during all games,” said Gavin, whose Dublin team begin their championship campaign tomorrow at Croke Park with a Leinster quarter-final against Longford. “The black card clearly states that if there is any provocative language or provocative gestures to an opponent, or indeed your own player, that you are automatically removed from the game and referees don’t have a choice. It is their job to be impartial and implement the rules or apply the rules. The Dublin manager — who’ll remain at the helm until the end of the 2017 season, it was confirmed yesterday — believes there’s also an onus of responsibility on managers and county boards to play a part. “It’s completely unacceptable. It’s a form of cheating,” Gavin said. “I’d go as strong as to say that if there’s a culture with a team that obviously a manager has control of, managers need to be held accountable for it if they’re seen to be promoting it and county boards need to hold their managers accountable. Email “Dublin boss: Sledging is 'a form of cheating' and refs need to take action”. 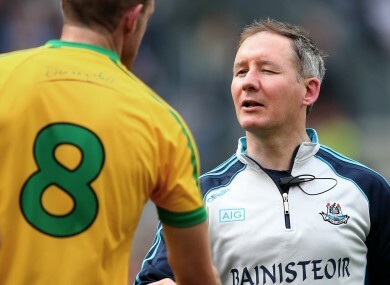 Feedback on “Dublin boss: Sledging is 'a form of cheating' and refs need to take action”.